This calculator will calculate the minimum payments and interest costs based on your current balance and the minimum payment method used by the issuer of your card. This calculator will also give you a month to month breakdown of principal and interest payments and, unlike other online credit card payment calculators, it will even tell you how many hours you will need to allocate to working to pay the interest charges on the credit card. 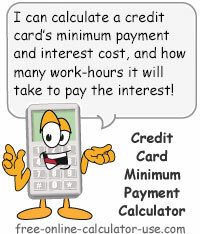 Calculate a credit card minimum payment and the resulting interest costs and required work-hours. Enter the current balance on your credit card, without the dollar sign and any commas. If you have added any charges to your card since your last statement, be sure to include those as well (you can use the "Pocalc", or "Pocket Calc" to add them up). Enter the annual interest rate you are being charged by the credit card company. Enter as a percentage but without the percent sign (for .1899 or 18.99%, enter 18.99). From the drop-down menu below, select the method the credit card company is using to calculate your monthly minimum payments (call and ask if not explained on your statement). If you choose the 2nd option (Enter % -->), go ahead and enter a custom percentage in the field provided. Enter the lowest allowable minimum payment without the dollar sign. For example, if your credit card company states your payment will be 2% of the balance, or $15, whichever is greater, enter 15 in the field provided. Optional: If you want to see how many hours you will need to allocate to work just to pay the interest charges on your credit card, enter your real hourly wage in the field provided. Otherwise leave blank. Note: If you click on the link, the Real Hourly Wage Calculator will open in a new window. If you would like the results to include an amortization schedule, move the slider control to the "Yes" position. This is your current minimum payment, which will decrease as your balance decreases. This is how much interest you will pay on your credit card if you only make the minimum payments between now and when you make your final minimum payment. This is how many minimum monthly payments you will make between now and when you make your final minimum payment. This is how many hours you will need to allocate to working just to pay the interest charges on this credit card -- provided you don't add any new charges to the card. Enter the current balance on your credit card. Enter the annual finance charge rate being charged by your credit card company. Enter a custom minimum payment percentage, or select a percentage from the drop-down menu. Enter the minimum payment dollar amount allowed. If you want to discover how many hours you will need to allocate to working to pay the interest charges that will accumulate between now and when you make your last minimum payment, enter your Real Hourly Wage here. Indicate whether or not you want the calculator to include a monthly amortization schedule in the results. Click the "Calculate Minimum Payment" button. This will display the minimum payment, the total interest charges, the total number of monthly payments, and -- if you entered a real hourly wage -- how many hours you will need to allocate to working to pay the interest charges on your credit card. I've never sat in on a board meeting at one of the top credit card companies, but I imagine it involves an ivory table surrounded by crushed velvet chairs, all occupied by cigar-smoking, mafia-looking characters -- each wearing the most expensive Rolex and (pant)suit money can buy. At the front of the meeting room, I see an overhead projector screen displaying two pictures. The picture on the left is of a happy, moderately dressed consumer, accompanied by his/her equally happy spouse and children. The picture on the right of the screen shows the same consumer as on the left, but in this case, the consumer is not accompanied by a spouse and is extremely sad, broke, and depressed. Just to the left of the overhead projector screen, I see a character who looks more devilish than the rest. This devilish character is explaining to the round table of high-priced subordinates that the key to increasing their already shamelessly huge bonus checks is to come up with better and faster ways of turning the consumer pictured on the left side of the screen, into the consumer pictured on the right of the screen. Of course, the reason the leader of the board meeting is the leader in the first place is that he and his peers were asked to come up with barely-legal ideas for turning happy consumer families into unhappy, broke and broken families. It was his idea to offer their unsuspecting customers the option of making "minimum payments" that would barely cover the interest charges. A raucous standing ovation ensued, and the rest, as they say, is history. Not really. Thanks to credit card companies and their minimum payment imprisonment schemes, "America, land of the free" should be changed to "America, land of people who might have 30 minutes of freedom right before they go to bed." Over the past 20-years, we Americans -- who've always been so proud of our freedoms -- have consciously and unconsciously traded most of our freedoms to lending institutions. As a result, most of us no longer have the freedom to choose what type of work we do, where we work, how much of our time we spend working, or where we will live. Those once-free choices are now dictated by how much the wardens (lending institutions) tell us we have to pay them every month. Who would choose to spend 2-3 hours a day stuck in rush hour traffic? Who would choose to transport their beloved children (who are only children for a short while) to a professional child-raising facility 5-6 days a week? Who would choose to spend their days being a worker bee in a honeycomb of 10' X 10' cubicles, performing a work that allows for no creative self-expression? If those are choices you are making because that's how you like your life, then my hat is off to you for at least having the freedom to make those choices. No matter how you look at it, increasing your debt serves to limit your freedom of choice. The more debt you have, the less freedom of choice you will have. And the more you choose to make only the minimum payments on your credit cards, the longer it will take you to get back the freedoms you once enjoyed. By the way, there is a segment of our population who have very little freedom of choice. We call them "inmates." If you want to remain an inmate in the debt prison and ensure that you get to serve the maximum sentence for your financial indiscretions, then by all means, make only the minimum payments on your credit cards and do your part to help the credit card company exec's to set new, all-time-high records for year-end bonuses.